The Meaning of Birds by Jaye Robin Brown was the first book I read during my March Break Read-a-Thon, and I absolutely adored this lovely little tale of heartbreak and healing. The Meaning of Birds is emotional and raw, really exploring Jess’ emotional journey and growth. Furthermore, The Meaning of Birds puts LGBTQ2+ representation and relationships at the forefront of its story, giving Jess and Vivi’s lesbian love its time to shine. Finally, Jaye Robin Brown’ writing is both lyrical and powerful, imparting experience and knowledge, even as the plot slowly meanders along. First up are the characters, and their roles in Jess’ emotional journey – both before and after Vivi’s untimely death (which, FYI, is totally not a spoiler – her unexpected death is spelled out in the synopsis of this book, after all!). Before Vivi’s death, Jess encounters Vivi as a new student at school – but struggles to connect with her because Jess struggles to cope with her anger. But Vivi’s sees past this tough exterior, and as she and Jess grow closer, Vivi teaches Jess how to manage her anger – by losing herself in art, and in love. It was fascinating to see Jess grow during her time with Vivi. She never quite leaves her anger and impulsiveness behind, but she finds was to manage it, and focuses more on the good around her, rather than on the negative. After Vivi’s death, Jess loses herself to grief and the same rage that once consumed her – lashing out at schoolmates, friends, and family. Honestly, she’s a hot mess – she drinks a lot, she fights a lot, she even steals. Plenty of people try and help her – try to push her towards what they think is best. For example, Levi offers her a shoulder to cry on and a friend to get into trouble with, but tries to create a romance with Jess rather than fully respecting her. Similarly, Cheyenne tries to push Jess into continuing to live her life exactly as she had planned with Vivi – by creating art and applying to college. And don’t even get me started on Jess’ mother, who is the embodiment of “mother knows best”. In the end though, Jess forges her own path forward, which I quite enjoyed, because I felt that Jaye Robin Brown really maintained that grief is a personal journey that Jess had to sort through in her own way, in her own time. Furthermore, The Meaning of Birds puts LGBTQ2+ representation and relationships at the forefront of its story, giving Jess and Vivi’s lesbian love its time to shine. Right from the get-go, Jess is very assured of the fact that she is attracted to women. Before Vivi’s death, their relationship highlights this, and gives meaningful representation to YA lesbian couples. After Vivi’s death, Jess isn’t “questioning” per say – but she is unsure about how she could ever love another woman without it feeling like a betrayal of Vivi’s love. This leads to some questionable decisions, including (but not limited to) Jess trying to “turn herself straight” because that would somehow mean that she would never cheat on Vivi. This is evidently problematic for various reasons, but in the end it does stay true to Jaye Robin Brown’s portrayal of Jess’ identity crisis following Vivi’s death. 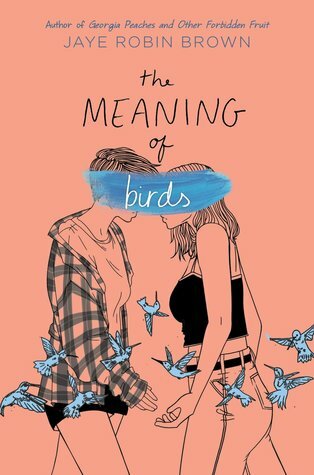 Beyond that, The Meaning of Birds features several other LGBTQ2+ characters, including an adult lesbian couple, an aromantic friend, and a few other lesbian characters (whose appearances are brief, but still recognized). Finally, Jaye Robin Brown’s writing is both lyrical and powerful, imparting experience and knowledge, even as the plot slowly meanders along. Jaye Robin Brown’s writing style is beautiful and easy to read, drawing the reader into the story without a second thought. She has a way with words that really imparts emotion, which really has the reader feeling the things Jess is feeling throughout The Meaning of Birds. Despite this, the story did seem to meander along – and not because of the dual timelines (this actually bettered the story, and made Jess’ emotions more powerful) – but because at multiple points throughout the story there really didn’t seem to be an “endgame” or purpose. Overall, I quite enjoyed The Meaning of Birds by Jaye Robin Brown – from engaging characters to Jaye Robin Brown’s prowess at imparting emotion in her writing, it was hard not to be enraptured by Jess’ journey through grief (4.5/5).